October 21, 2009 Dan O. 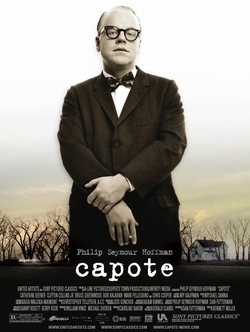 Watching Seymour Hoffman play Capote, is something out of the ordinary, weird, but out of the ordinary. The film follows Capote’s life during the making of his acclaimed book, In Cold Blood. It shows the stories behind the main story and Capote’s relationship with the prisoners that are being wrote about. The film paints a fascinating human portrait of this mysterious but ver loveable author, Truman Capote. The one great element of this story shown is how one Capote soon falls in love with one of the prisoners, Perry, and the film shows his love for him but also his need for him to die. Because if Perry doesn’t die Capote has no story. If you would’ve told me this was directed by Scorsese or Mann, I would’ve believed you but this directorial debut from Bennett Miller is so well done. Bennett Miller shoots some the scenes with such a look that you can feel the emotion that Capote is feeling at that time during the scene. May biographical films are usually dry and familiar but Capote, on the other hand, is full of life and in praise of joy for this great writer. This is honestly one of the greatest performances in the past 10 years of any film. Philip Seymour Hoffman gives this landmark performance, and the amazing thing about his performance is that he’s not simply doing an impersonation but he is getting to the heart and the core of Truman Capote. Mostly making us feel what he is feeling at that particular moment in time. Surely a very marvelous performance that defensibly deserved the Best Actor win. Also im very suprised they put Harper Lee’s character in, but im also pretty glad because Catherine Keener does a very good job at portraying her with such sensibility and a person who can see right through Capote and who’s also very critical of him cause she knows what he is capable of doing. Though this film is great it’s not perfect. Bennett Miller may show a small flair with certain actors, but there’s a flatness to the manner in which he frames some of the scenes. I also felt the film dragged in spots. At times I didn’t feel to absorbed by Capote’s real world that he lived in, which could’ve been a game breaker for me. This film boasted by a speechless performance from Seymour Hoffman, and a well-written portrait of a unspoken author. Capote succeeds in many ways that many should see, even if it does drag at times.